Collections by Weiser offers five handlesets to choose from. These handlesets offer solid forged brass construction and Grade 1 cylinders for uncompromised security. With a touch of the coast, Avalon's sweeping curves provide a heightened sense of style. This privacy knob/lever is best used in interior bed and bath applications where privacy is required. Both knobs/levers are locked or unlocked by turn button inside. The outside knob/lever can be unlocked by an emergency key. The Venetian Bronze finish is hand-rubbed to reveal unique bronze highlights and provides a rich and warm complement to the product's style. Welcome Home Series<sup></sup> handlesets are the perfect addition to your front door to create a unique and fashionable entryway to your home. Each is stylishly designed to provide maximum-security protection. There are many styles, finishes and configurations from which to choose. The straight styling of the Aspen lever creates an elegant, contemporary feel This privacy knob/lever is best used in interior bed and bath applications where privacy is required. Both knobs/levers are locked or unlocked by turn button inside. The outside knob/lever can be unlocked by an emergency key. The Venetian Bronze finish is hand-rubbed to reveal unique bronze highlights and provides a rich and warm complement to the product's style. Elements by Weiser provides an expanded choice styles and finishes at an affordable price. The smooth simple lines of the Belmont lever and wave style design is an attractive addition to any home. This privacy lever is best used in interior bed and bath applications where privacy is required. Both levers are locked or unlocked by a turn piece. The outside lever can be unlocked by an emergency key.The lever is reversible and mounts on both left and right handed doors. The Iron Black finish provides a rich and warm complement to the lever's smooth styling. Welcome Home Series<sup></sup> handle sets are the perfect addition to your front door to create a unique and fashionable entryway to your home. Each is stylishly designed to provide maximum-security protection. There are many styles, finishes and configurations from which to choose. The elongated bowed lever design of the Galiano lever conforms nicely to the palm of your hand This privacy knob/lever is best used in interior bed and bath applications where privacy is required. Both knobs/levers are locked or unlocked by turn button inside. The outside knob/lever can be unlocked by an emergency key. The Satin Chrome finish gives the product a modern and minimalist look. 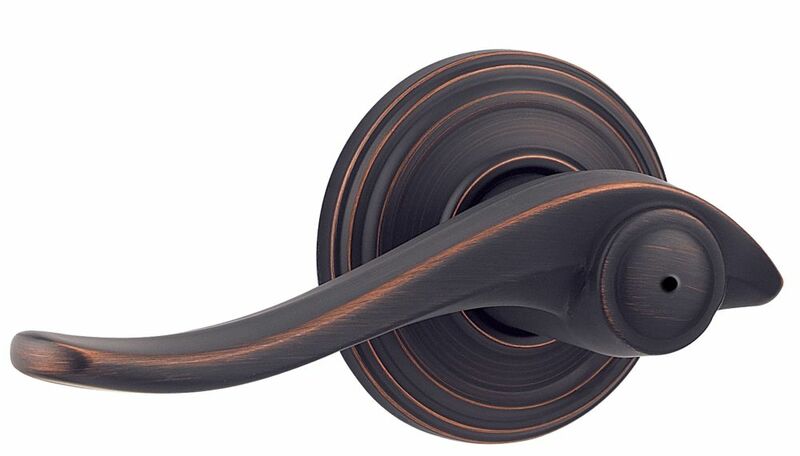 Avalon Venetian Bronze Privacy Lever Collections by Weiser offers five handlesets to choose from. These handlesets offer solid forged brass construction and Grade 1 cylinders for uncompromised security. With a touch of the coast, Avalon's sweeping curves provide a heightened sense of style. This privacy knob/lever is best used in interior bed and bath applications where privacy is required. Both knobs/levers are locked or unlocked by turn button inside. The outside knob/lever can be unlocked by an emergency key. The Venetian Bronze finish is hand-rubbed to reveal unique bronze highlights and provides a rich and warm complement to the product's style.